Without solid evidence to back my point, it seems that Dutch Heidevolk would have just as many loyal fans as they would have detractors. For the first group Heidevolk music would be highly gratifying, while the second will find it simply grating. I am going to try to take the position of a neutral bystander and comment on their latest output Velua. The previous album Batavi took Heidevolk into the darker, more blackened direction. The melodies and especially the vocals indicated that, but Velua proves that foray was temporary and Heidevolk only tilted in that direction because of probably lyrical matter. Velua sees the Dutch exploring the mystical nature of their native lands, and it also confirms the return to their now trademark barbaric romanticism, whether you like it or not. Power chorded folk-tinged melodies, snappy bass, pummeling double bass and signature distinct dual – clean and gruff – male vocals characterize a lot of songs on Velua. 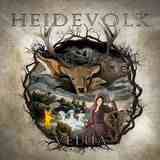 My main problem with many Heidevolk albums, and Velua is no exception, was the lack of prominent draw in every composition. With some of Heidevolk songs (Nehalennia from Uit oude grond, and now Herboren in vlammen and Urth on Velua) you simply cannot get the main hook out of your head. Trust me, you will be humming Herboren in vlammen on your way to bed, waking up, taking a shower, driving to work, etc. I did anyway. But then many of the Heidevolk songs are just there. I cannot say anything bad about them, but De hallen van mijn vaderen and Een met de storm compared to Herboren in vlammen and Urth appear non-distinguished, and even title track leaves the promises of mysterious journeys somewhat unfulfilled. To give Heidevolk credit, they are pushing themselves on Velua. Herboren in vlammen and Het dwalende licht provide some rousing solos. Winter woede, Drankgelag (appearing to us from some drinking hall someplace) and Richting de Wievenbelter offer glimpses of violin and other symphonic arrangements, Richting de Wievenbelter seeing female vocals also entering the field, the song serving as a surrogate of a ballad on the album. In het diepst der nacht is a solid combination of aggressive gallop and melodic overtones, and Vinland (bonus song? ), the only one sung in English, is a pretty cool bouncy tune in its own right. In short then, there is a lot of meat for your teeth to bite into on Velua, it is just some of the protein is not always juicy. The news out of Heidevolk camp was that they are losing a pair of members, yet they are still determined to go on tour. All of luck to the Dutchmen, plus perseverance, they will need it.